Heat the olive oil in a large nonstick pan and sauté the potatoes over medium heat until they are dark brown on all sides and caramelized, but still fairly firm, about four to five minutes. Once the potatoes are about 60 percent cooked, remove from heat and set aside. Preheat the oven to 350°F. In a large mixing bowl, toss the potatoes with the rest of the ingredients, except the cheese. Pack the mixture into a large (13x9x2-inch) casserole dish until it is stacked about 1⁄2-inch high. Sprinkle the cheese on top. Transfer the dish to the oven and bake for 30 to 40 minutes, until the potatoes are tender and the cheese is completely melted and browned. ■ Cheese, please: “I prefer a cave-aged blue cheese, but my wife likes goat, so it’s usually goat at our house,” Glowacki laughs. Whichever side you fall on, both pungent cheeses pack a flavor punch, he says. 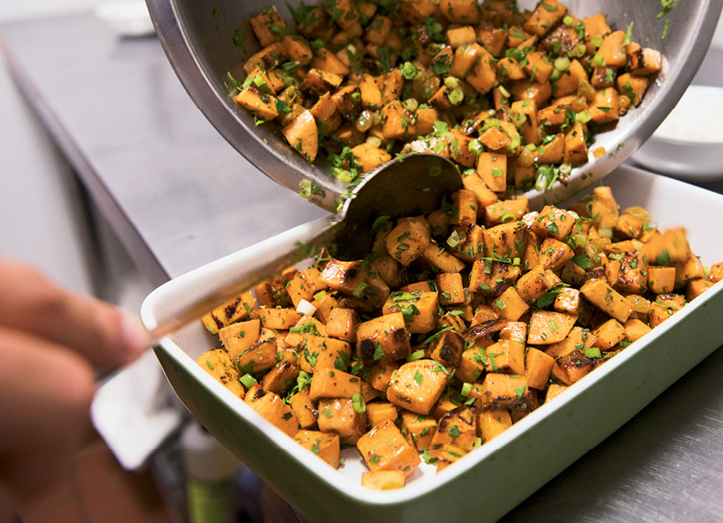 ■ Balancing act: To ensure that the sweet potatoes have a uniform consistency, Glowacki suggests cooking the cubes in batches to avoid overcrowding in the pan. “You want the potatoes to be caramelized and a little crispy,” he explains. ■ Black Friday lunch: “The day after Thanksgiving, I load two slices of bread with stuffing, cranberry sauce, and turkey. It’s heaven,” Glowacki says. Any leftovers—including this casserole—are fair game for piling on.